The inside of the Vantare Platinum Plus is even more impressive than the outside, and we can see why people would pay millions of dollars for an interior like this. 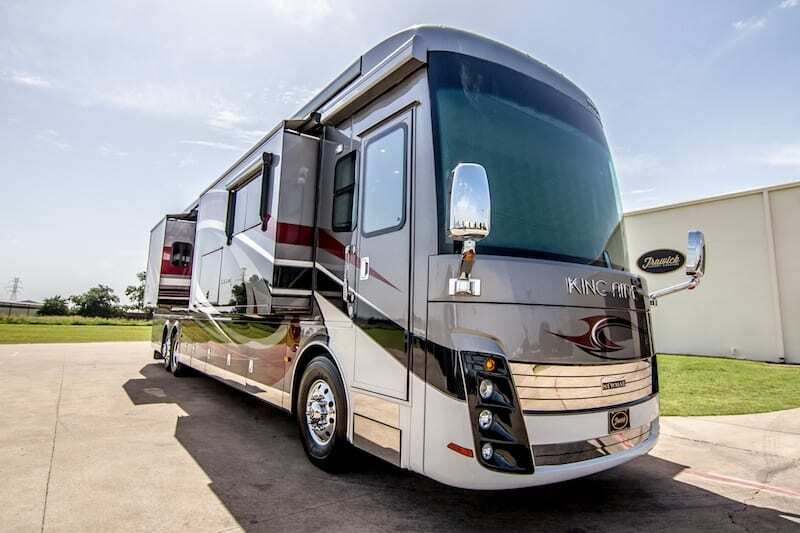 With a custom Italian couch, suede lined draws, Swarovski crystal lighting, a king-size bed, and even a built-in treadmill, this motorhome has everything you could possibly want from a home-on-the-go on the inside. You can eat, sleep, drive and chill out in this space, and we’re jealous of anyone that gets to do that. Fancy giving us a ride? 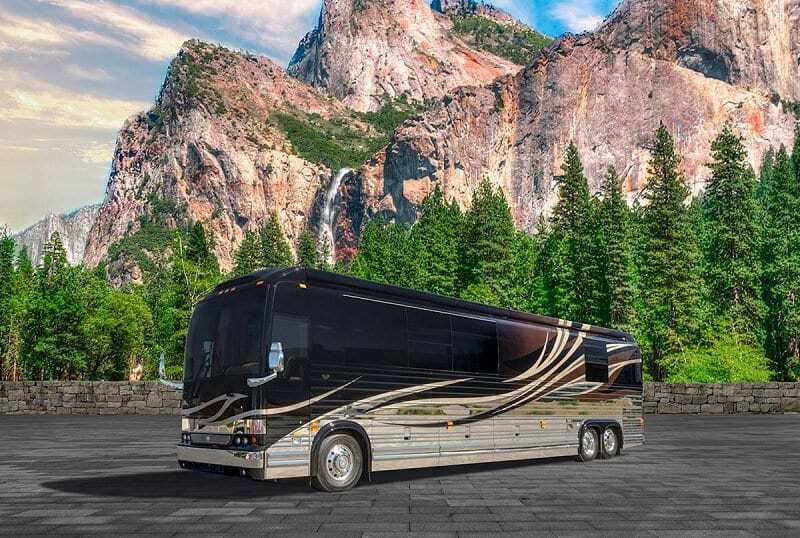 The Newmar King Aire is perhaps one of the most luxurious mobile homes out there, and you probably don’t need us to tell you that. Just look at the shine on that baby. This particular model has a starting price of $1 million – so it’s just small change really. However, with each change and custom design, you make to this trailer the price will go back. Of course, this isn’t a bad thing if you have the money, because you can make yours totally unique. What could be better than that? We have serious interior design envy right now. 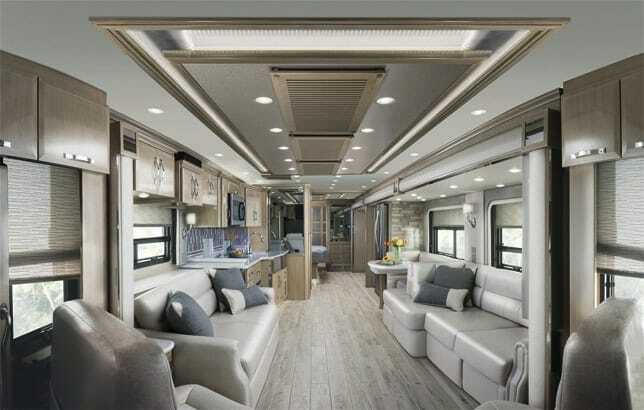 The inside of the Newmar King Aire looks like the beach house you always wanted, but the best thing about this mobile home is that you can move it from beach to beach! With plush and organic gray interior, this trailer looks fresh and modern, and gives you all of the mod-cons you could possibly need. Our favorite little gadget within this mobile home is the tablet that sits next to the driver, who can then control every single thing behind them! The Newell #1519 is just another number to add to their impressive fleet, but this one definitely stands out in our eyes. Although this model was released in 2015, it’s still one of the most attractive mobile homes to ever exist. This 45-foot trailer comes complete with an exceptional paint job, high mount mirrors, a mid-entry floor plan, five window awnings, and that’s just the start. However, if you weren’t sold on all that you definitely will be sold on the inside. Better get your $1.7 million ready. 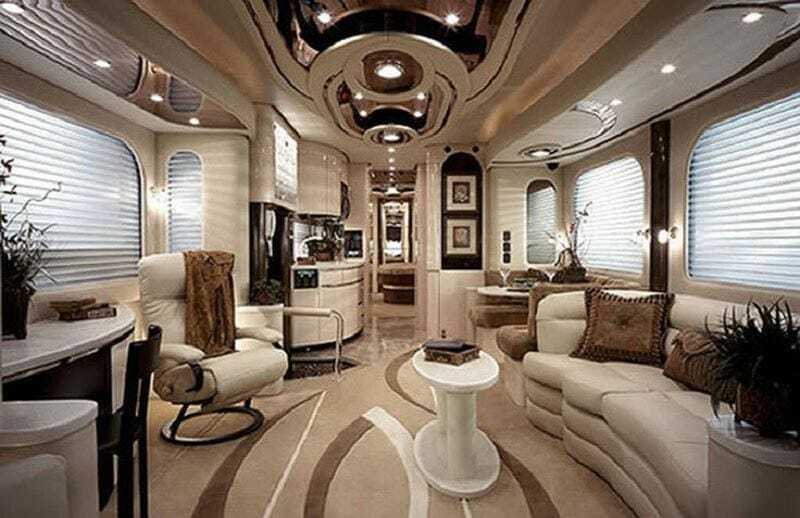 The inside of the Newell #1519 is one of the reasons why we would totally shell out $1.7 million on this mobile home if we had that kinda money. With sleek and sophisticated decor running through the whole of this trailer, every inch of this interior is perfect. From the ceramic tile flooring to the decorative sconce lighting, to the Corian countertops and the little added touches, this whole place has been decked out to a high standard. 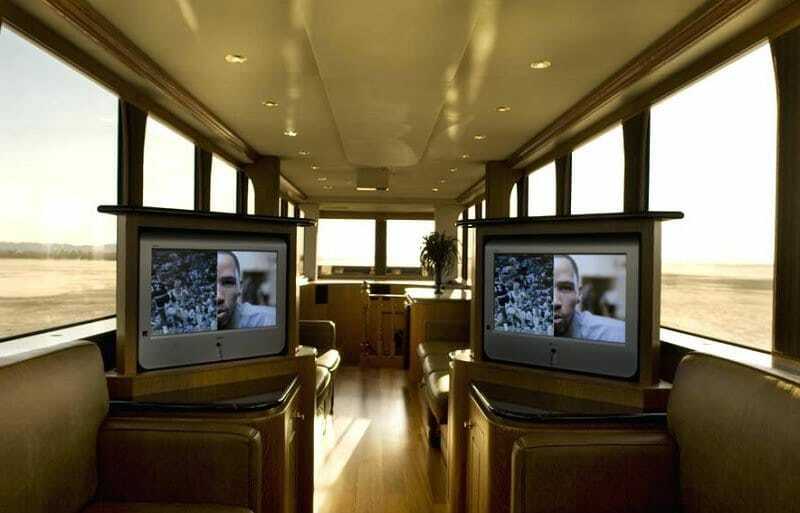 As if that wasn’t cool enough, this trailer also boasts three televisions! The Featherlite Solstice has not even been released yet, but it’s already tipped to be one of the most beautiful mobile homes on the planet. This triple slide coach looks absolutely stunning from the outside, and we can’t get enough of the color scheme. Black, orange, and blue? It’s a revelation. 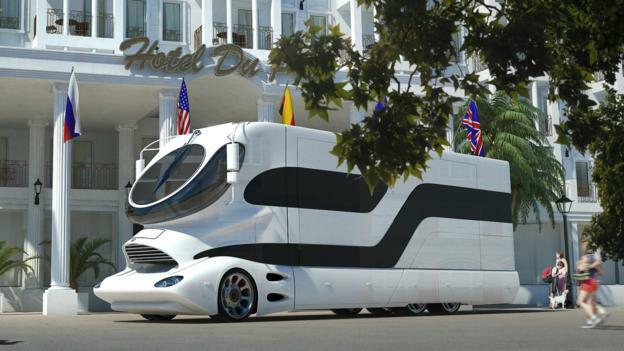 Yes, it’s fair to say that this $2.2 million trailer is definitely off the scale and is ready to impress when it is officially released to the public. Wanna know what? The interior is even more impressive. The inside of the Featherlite Solstice is the epitome of class and modernity. In fact, we kinda want to replicate our own homes on this design because we love it so much. With neutral tones running through the cabin, it’s ready and waiting for you to add your own personal touches. Until you do that, you can enjoy the 60” 4K TV with Apple TV and an XBOX 1S, the huge walk-in shower, the heated walnut flooring, and all of the tech you could possibly need. We would like ten of these, please. 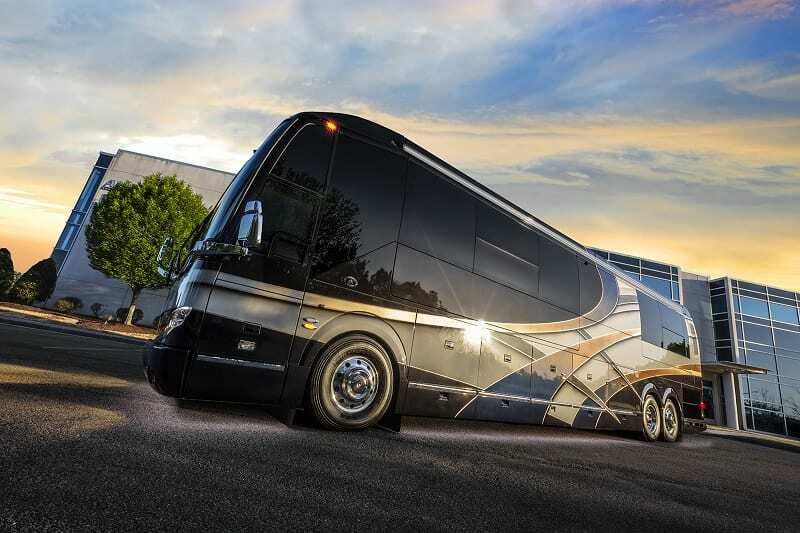 When a motorhome is built for VIP customers, you know it’s going to be a big deal. 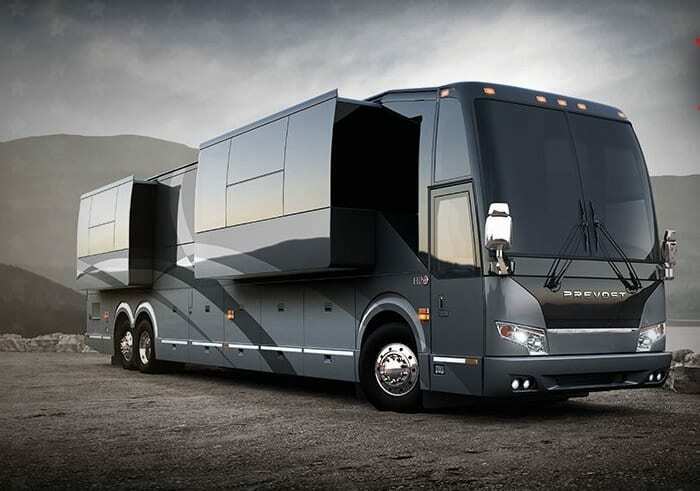 Thankfully, the Prevost H3-45 VIP has lived up to its name and is one of the most beautiful and luxurious mobile homes on the market. For around $1.6 million plus, you could be the proud owner of this sleek black and gray number that will turn heads as you drive down the open road. Just look at those hubcaps. You could do your makeup in the shine of those bad boys. 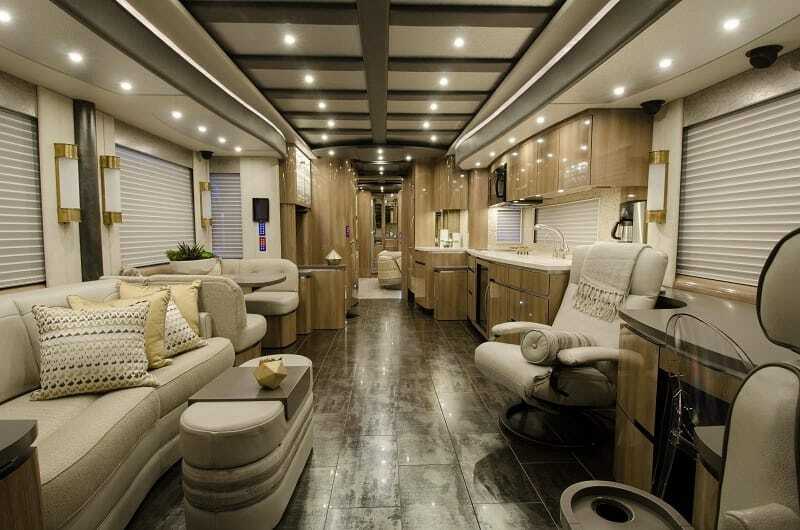 The inside of the Prevost H3-45 VIP is just as worthy for rich and famous customers because it has everything you could possibly want for the ultimate comfort experience. From the marble-effect floor to the chic leather couches and lighting that will be perfect for your social media selfies, this mobile home is interior design heaven. Decked out in all of the latest mod-cons, you can chill out and watch a movie while the driver takes the wheel. That’s if you have a few million in the bank. We certainly don’t. You might not think Will Smith is the kinda guy to rock around in a trailer, but it seems as though ‘The Heat’ goes everywhere he goes – especially if he’s working on a movie. This two-story trailer set him back a whopping $2.5 million and was painstakingly created by one of the best names in the mobile home business; Anderson Mobile Estates. Yes, this trailer is 30 tons of tech and incredibly interior and has to be transported across the country by one beast of a truck. The inside of The Heat is even more impressive than the outside because it’s Will Smith’s very own two-story house on wheels. While the decoration might not be to everyone’s taste, it seems as though Will has got it just how he wants it. On the lower level, he has Star Trek-inspired doors that make swooshing noises whenever they open and close; he has offices for his assistants, his own personal bedroom, a chill-out area, and a whole lot more. On the upper level, he has impressive views alongside his own TV area and a business lounge. 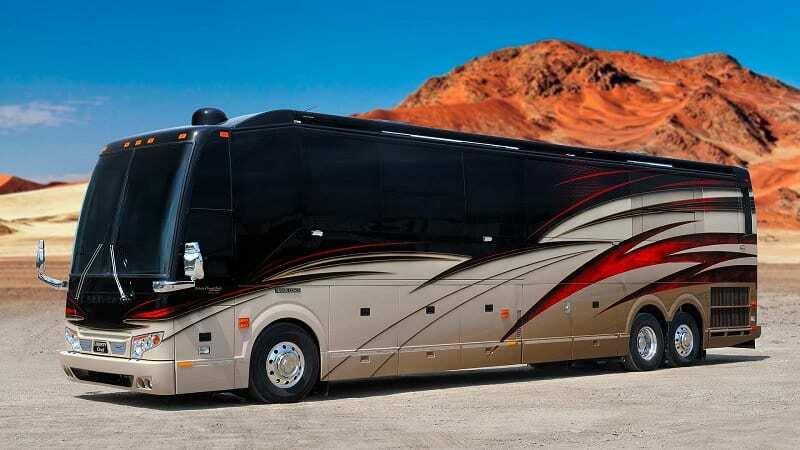 For just $2.2 million, you could call the Liberty Coach Fairfax Edition your own. After all, it’s just small change in the life of a millionaire. Unlike other mobile homes on the market, this Fairfax edition features a custom paint job from one of the best in the business. Yes, you have Dean Loucks to thank for this blue, white and black color scheme, because he personally designed and painted this mobile home for your pleasure. We have to admit, it looks pretty darn great, especially when you don’t think about the price. If you like the finer things in life, we have a feeling that you will love the interior of the Liberty Coach Fairfax Edition. The piece de resistance of this mobile home is the walnut cabinetry that snakes its way around the cabin and adds an air of sophistication into the walls. If that wasn’t enough to get you hooked, this mobile home also features heated flooring, two large storage bays, a high-tech home entertainment system, as well as top-of-the-range air conditioning, so you’re prepared for any weather. The Foretravel ih-45 looks pretty fancy from the outside, which is probably because it was custom-built using airline technology and materials from some of the fastest aircraft in the world. 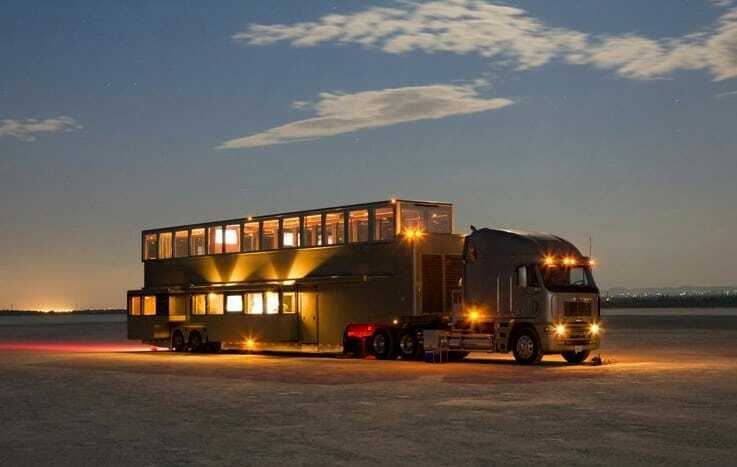 Because of this, it’s made a name of itself as one of the quickest mobile homes on the market and is perfect for those who have a need for speed. However, that doesn’t mean it’s lost its attractiveness, because that shine is something else. Anyone got $1.3 million in their bank? Asking for a friend. The outside of the Foretravel ih-45 is enough to get anyone wanting more, and you’ll be happy to know that the inside is just as fancy. With a modern yet sophisticated look to it, this mobile home is the perfect mix of class and functionality. Not only has this trailer been decked out in some of the best furnishings on offer, it’s also been given the top of the range tech treatment. From the natural Quartz worktops to the electric flooring, this has it all. You can even choose between cherry, maple, or walnut cabinetry! The Morelo Empire Liner is one of the most clean-cut mobile homes on this list. Just look at it! The white lines are all perfectly clean, and it would look beautiful driving down any road in the world – although you might wanna hire someone to wash it. White RVs do show up the dirt much more easily. This mobile home is a fairly new addition to the world of trailers, but it’s already making waves with customers who like keep their living quarters clean, tidy, and totally minimalist. The inside will show you that. The inside of the Morelo Empire Liner is effortlessly cool, and you’d definitely need to take your shoes off before making your way up these steps. White and gray are the main neutral colors when it comes to the interior design of this liner, and everything has been constructed to modernist specifications. The walls are white, the tables are white, the couches are white, and even all of the appliances are white! However, the piece de resistance of the Morelo Empire Liner has to be the natural stone rainfall shower. It’s the shower of dreams. 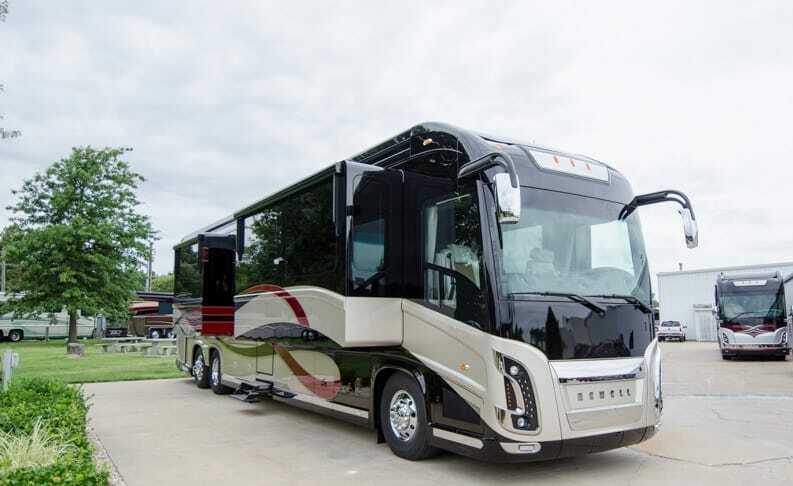 Okay, so the Earthroamer XV-HD may not be as big as some of the other mobile homes on this list, but it’s still just as beautiful. This trailer has been designed for optimum usage on all terrain. You can take it on the open road, you can drive it through off-road tracks, and you can take it anywhere you please. 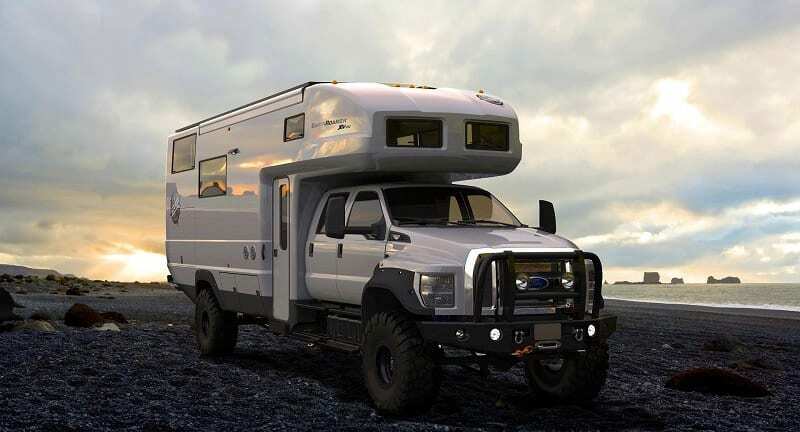 This motorhome looks a little more like your average 4X4 truck than a luxurious home on wheels, but trust us when we say that the inside will have you pining for nights under the stars in no time. We told you it was worth it. While it might not be much of a looker on the outside, the Earthroamer XV-HD is absolute bliss instead. Decked out in rustic Scandinavian style decor, it’s the perfect addition to any outdoor adventure. You can look out at the wilderness around you while knowing that you are as comfortable as you could possibly be on the inside. 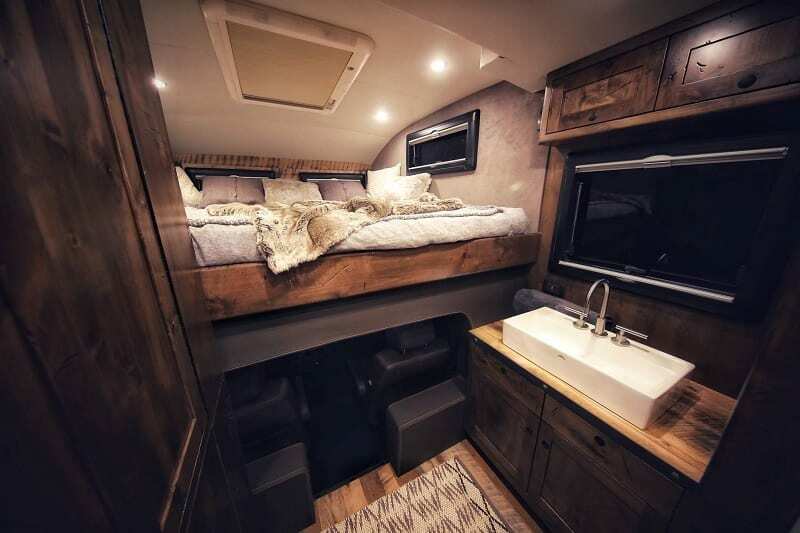 From reclaimed wood bed frames to lavish comforters and rugs, this is the kind of motorhome that will take you back to nature. The Marathon Coach #1285 will set you back $2.1 million. Although that may sound a like a bucket full of money, you actually get a huge amount of style and sophistication for this price. Boasting incredible road dynamics and engine performance, you could take this mobile home across the world, and it wouldn’t give you any problems. 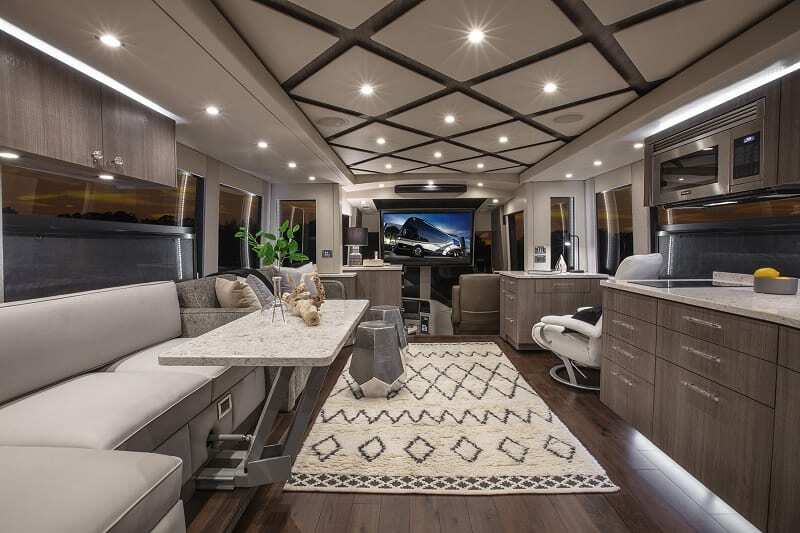 Unfortunately, you won’t be able to get your hands on this trailer until 2019, but you can ogle over these incredible pictures of the interior and exterior. If you love your browns and your natural colors, you’ll love the interior of the Marathon Coach #1258. With deep rich leather and dark wood surrounding the cabin, you won’t feel like you’re in a mobile home at all. Instead, you’ll be right at home with the various cushions and throws, as well as the plants that bring nature back into your life. With a huge bed and a gold sink in your bathroom, we really don’t know what more you could need in your life. We’re sold. 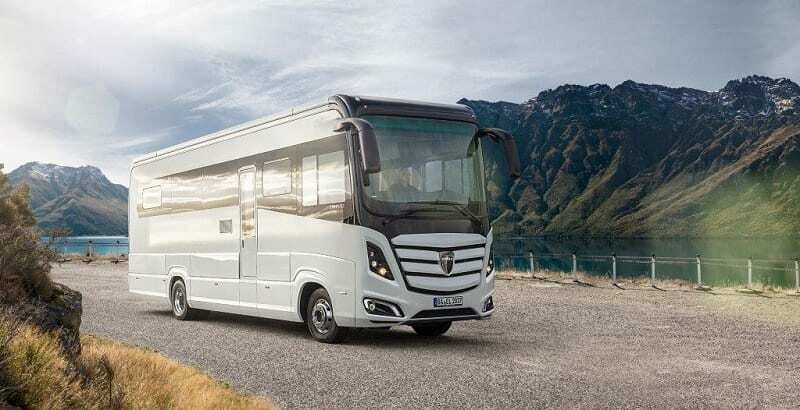 The Marchi eleMMent Palazzo takes the trophy as the most expensive motorhome in the world, and we’re not sure we’d even call it a motorhome. From the outside, it looks like a roadworthy spaceship, with lumps and bumps in all of the right places. 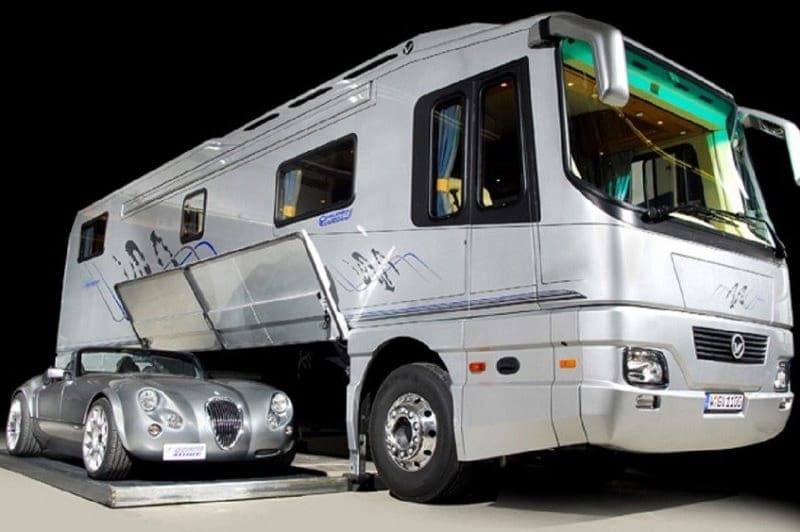 Okay, so it might not be everyone’s cup of Joe, but there are some people out there who are forking out $3 million for this futuristic motorhome with a circular panoramic cockpit. No, we didn’t just smash our fists down on the keyboard, it’s really worth $3 million! If you’re a fan of minimalist design that utilizes every bit of space available, we have a feeling that the inside of the Marchi eleMMent Palazzo will be right up your street. This motorhome has been designed to be light and airy, but fully functional. 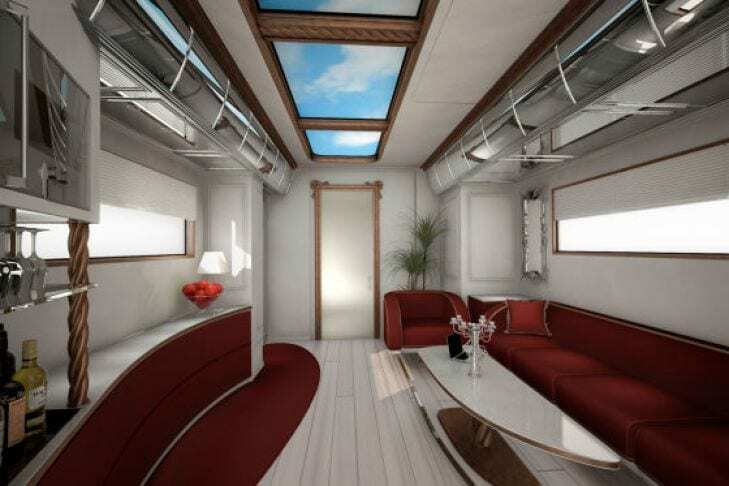 This mobile spaceship offers marble worktops, hand-cut wooden flooring, a full-length sunroof, sleek red velvet couches that span the entirety of the living area, as well as a fancy staircase that will take you to the upper deck. 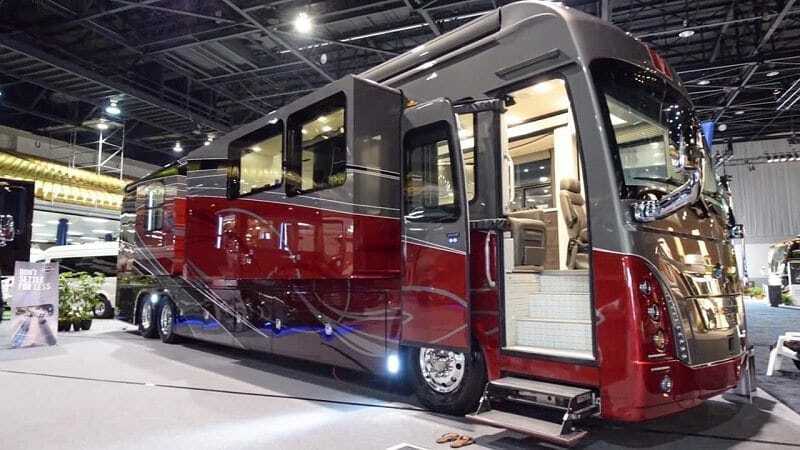 Because what kind of motorhome doesn’t have an upper deck! Pffft!